If your Page, Post or Custom Post Type, that you want to generate content for, has one or more custom fields defined by the Advanced Custom Fields Plugin, it’s possible to generate content for those fields through Page Generator Pro’s Content Groups. To define the content to generate for your Advanced Custom Fields, first you must update your ACF Field Groups to display within Page Generator Pro’s Generate Content screens. Don’t see a Custom Fields option in WordPress’ Administration Menu? 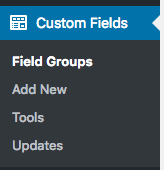 Your Theme or Plugin may be programamtically defining your ACF Field Groups and Fields. Please reach out to your Theme or Plugin developer to have them include the XYZ Post Type when outputting Field Groups. You will then see the applicable Fields in the Generate: Content screen. Keywords are supported in ACF registered Fields. Refer to the Using Keywords documentation.